Being a part of the aviation community, we know what an incredible accomplishment it is to reach training milestones like a first solo. Learning to act as pilot in command of an airplane is an amazing feat, but learning to fly and getting to that point has its highs and lows and triumphs and frustrations. And with everything in life, it feels good to get a pat on the back to know you’re doing well. AOPA’s research on the optimal flight training experience emphasizes the importance of recognizing student achievements and milestones and lists it as one of 47 key attributes that help retain a student in flight training. I’ve had the opportunity to meet folks that are running excellent flight schools and when you ask them how they celebrate their students’ milestones (not just a first solo), it further emphasizes their excellence and commitment to creating lifelong aviators. Here are a few of my favorite ways to celebrate flight training achievements. 1. Walking into the hangar, one can instantly see the pride Paragon Flight Training has for their customers’ achievements. 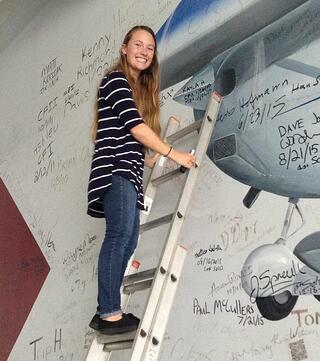 The Florida flight school has a fun and very visible way to commemorate success – each milestone is marked on their hangar wall mural with a personal signature and date. 2. Brunswick Air dedicates a portion of their webpage to customer achievements. That area is called the “Whoo-Hoos!”. 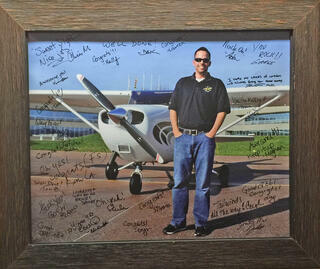 There are photos of student solos and of smiling faces after a successful Checkride. Each photo also features a short description about the accomplishment, as well as, recognizing the flight instructor who helped lead his/her student pilot to success. 3. While not exactly a flight school, employees of the Aircraft Owners and Pilots Association in Frederick, Maryland are strongly encouraged to learn to fly, no matter your position with the company. When a person solos or earns a new rating, a photo is taken of the pilot and then a poster-size photo is printed and hangs in the main hallway with a marker for everyone to sign and write congratulatory messages to the pilot. The pilot can then hang it in their office to commemorate a great memory. 4. One look at the Facebook page of Coast Flight Training in San Diego and you can’t help but smile. All of the photos and videos they post of their customers getting doused with water from a big blue bucket shows that hard work pays off, and during that hard work, you also make sure to take time for some fun and laughs. 5. San Carlos Flight Center in California does many things to celebrate milestones and foster community among their members, from lively Facebook posts and newsletter recognition to logoed gear, but the coolest part is that on page 134 of their private pilot syllabus, there is an actual checklist of things they want to help you achieve and celebrate. The checklist has 22 different milestones that include first beautiful unassisted landing, first full weather briefing, and joining their Fly Out Group for a dinner flight.